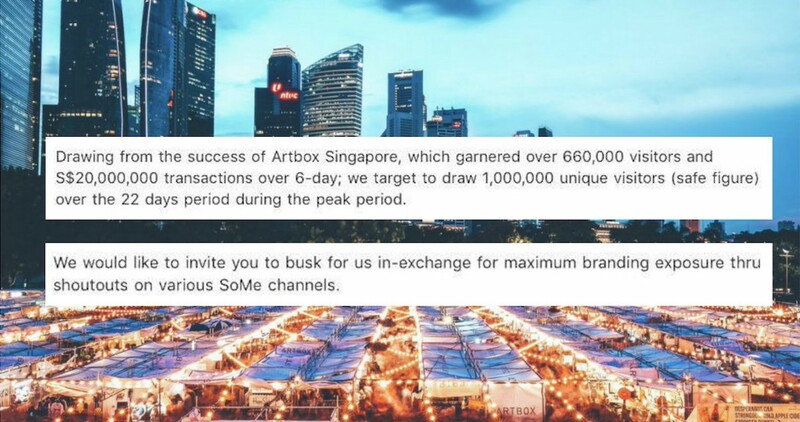 We are all well-acquainted with the inaugural Artbox Singapore – the local edition of the pop-up creative market popularised in Thailand – that took place in April earlier this year. Spanning over two weekends, the event attracted a big crowd of visitors to the extent that it received flak for being “overcrowded”; and the rainy weather only dampened (pun intended) the event further. Fast forward seven months later, Invade – the organisers of Artbox Singapore – announced that they will be hosting a new market called Flashbang Singapore in December. Whether they will learn from their past event and handle it better this time round in terms of logistics and layout is actually beside the point. This time round, the spotlight is cast on Invade due to a recent email they sent out to local performers. 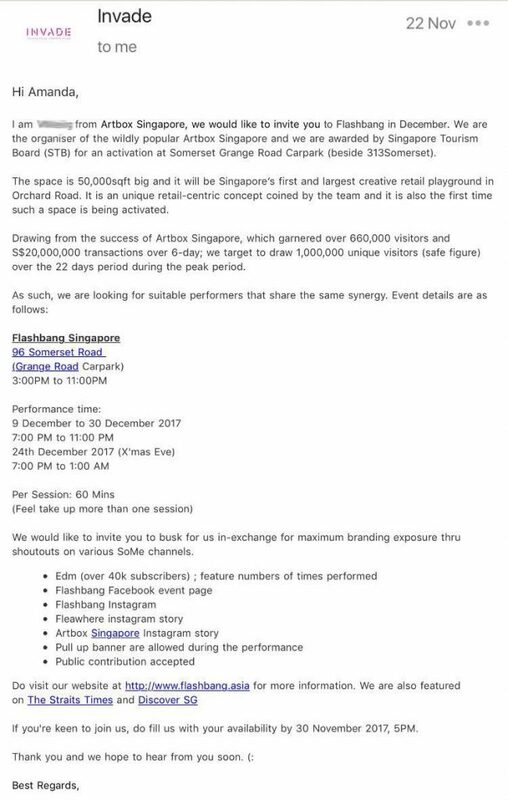 Facebook user Amanda Tee shared a screenshot of this email on her page, sharing her disbelief at the audacity of Invade to invite her to “busk for [them] in exchange for maximum branding overexposure through shoutouts on various SoMe channels”. In the email, the sender (staff of Invade) claimed that their previous event had “garnered over 660,000 visitors and $20,000,000 transactions over 6 days”. Tee balked at this proposal, and captioned her Facebook post with the above: “They want to pay musicians with “maximum exposure”, which bank do I bank it in ah?”. 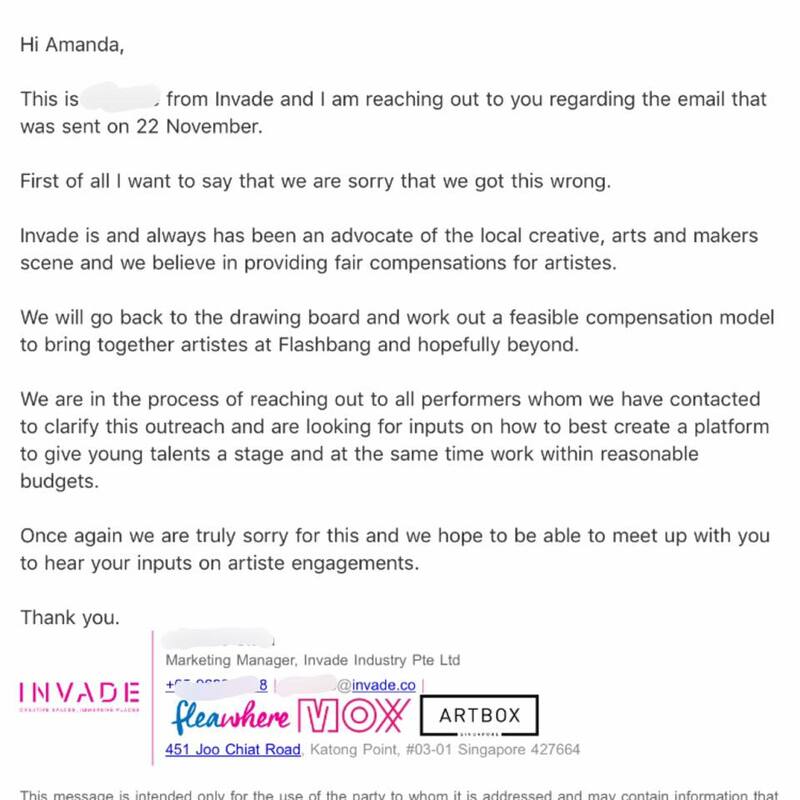 Invade also publicly apologised on this matter on their Facebook page. In less than a day (it was posted 21 hours ago), the Facebook post has gone viral, garnering 252 likes and 327 shares. Evidently, netizens were also angered at Invade’s email. And it’s safe to say that all, if not most of them, shared the same general sentiment: Exposure does not pay the bills. This begs the next question – should you work for free in exchange for “exposure”? Work For A Fee, Or For Free? If you’re new to an industry, taking on such ‘opportunities’ can help get your foot in the door. It can help you build relationships, gain an audience, and establish yourself. Ultimately, it is an effective way to build portfolio and increase demand; and employers know this. This is why they sometimes offer “exposure” in exchange for an unpaid job. There’s no doubt that work breeds work, and if you have no portfolio to show from past clients, it’ll be tough to snare new clients. So the occasional freebie is actually reasonable. But if you do choose to take on this offer, at least ask them to quantify what this means. Exposure is essentially advertising, and advertising is quantifiable. For instance, your exposure could be measured in clicks, page views, or retweets, for example. At the end of the day, while exposure can be great, let’s not fake the funk – you’re being asked to work for free. And by giving away your services, you are pretty much setting a bad precedent and inadvertently hurting the market. Giving away work sends the message that similar work can be procured for free. Also, once you fall into the trap of working for exposure instead of working for money, you’re going to find out just how hard it is to start charging money for your work. Primarily, you’ve got to understand your worth and time. Own your hard work, and value that.